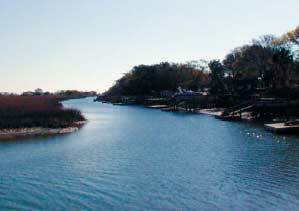 There�s just something special about living along the Charleston coastline. It�s a place where peace and serenity replace the stresses of a hectic lifestyle. So kick-back and relax. Take in the expansive marsh and tidal creek views, as the sun sets at the close of another day. Now this is living. The relaxed, carefree lifestyle you�ve been dreaming of is available today at Folly Creek Place. These luxury townhomes are located at Folly Beach, which is known for its natural beauty, history, rare birds, fishing, surfing and true Southern hospitality. There are no malls or big commercial ventures on this laid-back barrier island, but locals appreciate its close proximity to all the pleasures of downtown Charleston located just 15 short minutes away. 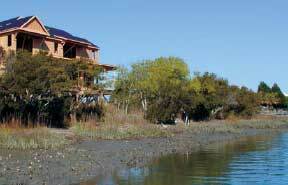 Nestled along a tidal creek, the townhomes at Folly Creek Place were developed by Charleston Land and Development (CLD), which has been serving the housing needs of Charleston since 1997. The townhomes were designed by SGM Architects and constructed by Tierra Homes with the intent of improving your living environment, lowering your operating costs and protecting your world. A registered product for LEED (Leadership in Energy and Environmental Design), each of these magnificent 1,950-squarefoot homes features its own boat dock and lift, so hours of boating fun are just a moment�s notice away, right out your backdoor. Each of these 3-bedroom, 2 1/2 bath townhomes features a spacious screened porch off the great room, and 10-foot smooth ceilings throughout the first floor. The master bedroom has its own private sundeck, with a Roman tub and separate shower highlighting the master bath. All bedrooms have exceptional salt marsh views. And if that�s not enough, each townhome includes a private four-car garage, and use of an exclusive community dock. And because of the property appreciation experienced on Folly Beach over the last decade, homes at Folly Creek Place are expected to prove to be good investments for buyers.